Watcher Shavmar is an undead Nede found in Skyreach Catacombs. Along with Armok and Garalan, he sacrificed himself to seal Virmaril in the catacombs after his betrayal of the Nedes. In order to reach Virmaril you must destroy Armok and the other watchers. 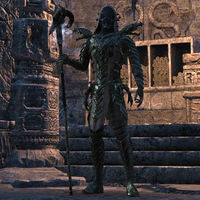 Souls of the Betrayed: Investigate a claim of necromancy and disturbed undead in Upper Craglorn. Despite looking like a dragon priest, Shavmar is a Nede and therefore unrelated to those Nordic forms of undead. This page was last modified on 10 August 2018, at 20:01.